I’ll begin by admitting that I was wrong. Taiwan is … pretty great. 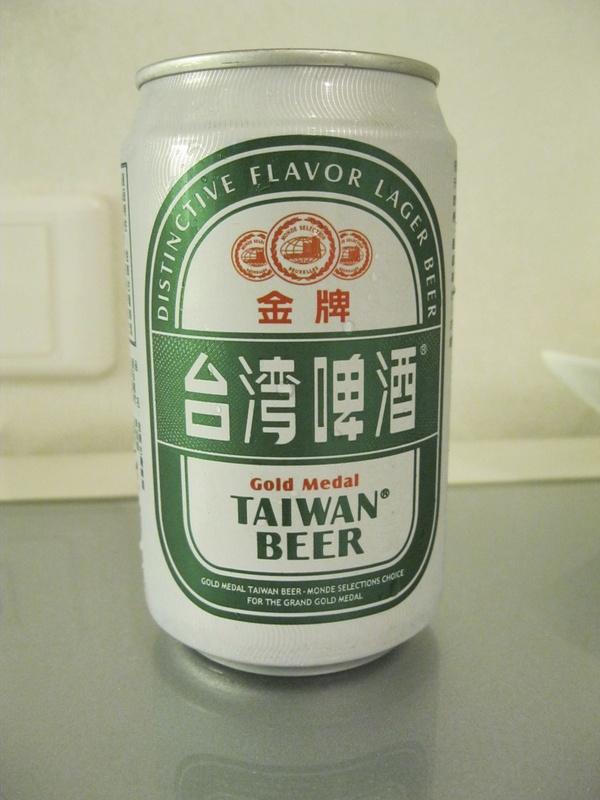 Maura’s Rules of Travel: always drink the local beer (hey, it won a gold medal!). So I made my Expedia reservations and downloaded the Lonely Planet Taiwan to my Kindle (side note: Lonely Planets can now be rented free with a Kindle Unlimited subscription, which is awesome—who wants to be stuck with a $15 guidebook after a one-time trip?) and on the appointed day, trekked out to Pudong Airport for my flight to Taipei. Fun fact: it takes 90 minutes to ride the subway from my apartment to the airport. It takes 85 minutes to fly from Shanghai to Taipei. Taiwan … it’s closer than you think. The closest I got to Taipei 101, once the world’s tallest building. Taipei is a very quiet city. I’m used to Shanghai, New York, Philadelphia: places where car horns honk and bicycle bells ring and people scream at each other over perceived slights. But this soundtrack was absent in Taipei, and although I found this aural peacefulness a little strange, it didn’t entirely bother me, either. 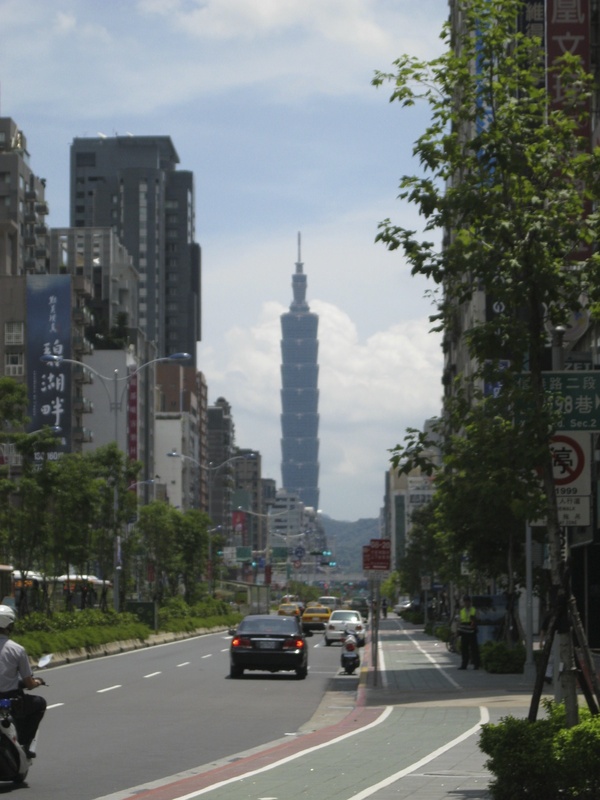 I had a cab driver one morning who took our ten-minute trip as an opportunity to sell me on moving to Taipei. His sales pitch focused on how much more livable Taipei is compared to cities on the mainland. “In Shanghai,” he said, “if you’re lost and you need directions, no one will help you. Here, we’ll tell you where to go.” He also pointed out that Taipei was cleaner than Shanghai (I can’t argue with that) and the atmosphere was calmer (also true). For a moment, it sounded appealing. But it’s hard to find a job in Taipei; all the opportunities these days are on the mainland. Besides, I like my world a little rough around the edges. Still, as I criss-crossed Taipei by subway and by foot, it wasn’t hard to appreciate its merits. A semi-tropical city, Taipei is green and lush in August, with regular afternoon thunderstorms that provided some relief from the otherwise intense sun. It’s pretty low-built, compared to Shanghai’s forest of high-rises, with a blend of Chinese, Japanese, and postwar cement-block architecture. Taiwan was a Japanese colony from 1895 to 1945, and in addition to physical buildings, those fifty years left a legacy of good sushi, nice hot-springs spas, and an appreciation for baseball that the mainland lacks. I also heard people credit the Japanese period for Taiwan’s orderly subway etiquette and law-abiding drivers, but I’ll let people more familiar with the island’s history than I am take up that claim. 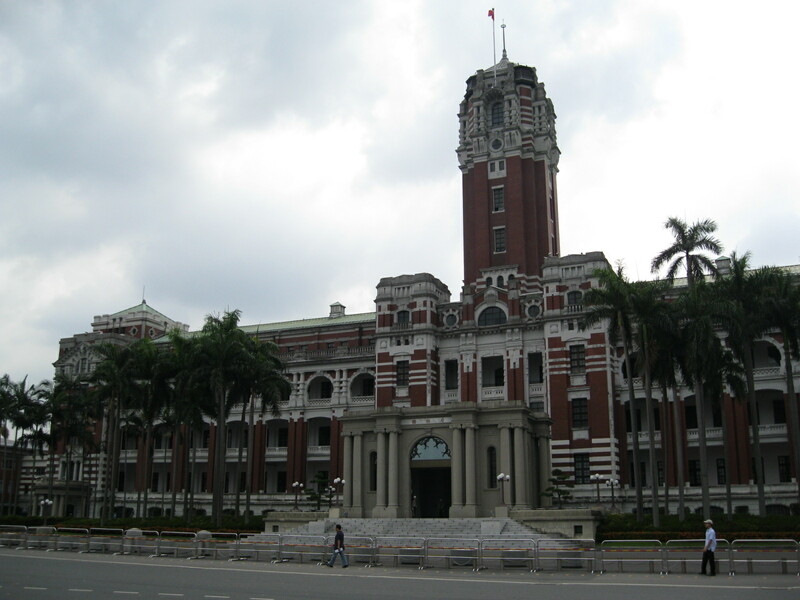 Presidential Office Building, built by the Japanese in the 1910s as the office of the Governor-General of Taiwan. But whatever the source, more than anything else, what struck me about Taipei was how conscious everyone was of observing the rules. A subway train would arrive and new riders would patiently wait on the platform for disembarking passengers to move away from the train before they boarded (which is supposed to be the procedure on the Shanghai subway, but never is). Announcements reminded passengers not to eat or drink—or chew gum or betel nut—in the subway, and no one did. People formed a single-file line to step onto escalators, and then stood to the right to let those in a hurry walk up the left-hand side. Cars stopped for pedestrians at street crossings. It was like … Bizarro China. Shaved ice dessert. It tastes way better than it looks. I stayed at the conference hotel near Academia Sinica while the meeting was being held, then moved to a hotel in the Banqiao district of New Taipei City after it was over. Even though it was a little removed from the city center, I had settled on Banqiao as my base of operations because the hotels there were much less expensive but the subway was still convenient and could get me into central Taipei within half an hour. It also turned out to be much more of a neighborhood, and I really enjoyed being in a less touristy area. 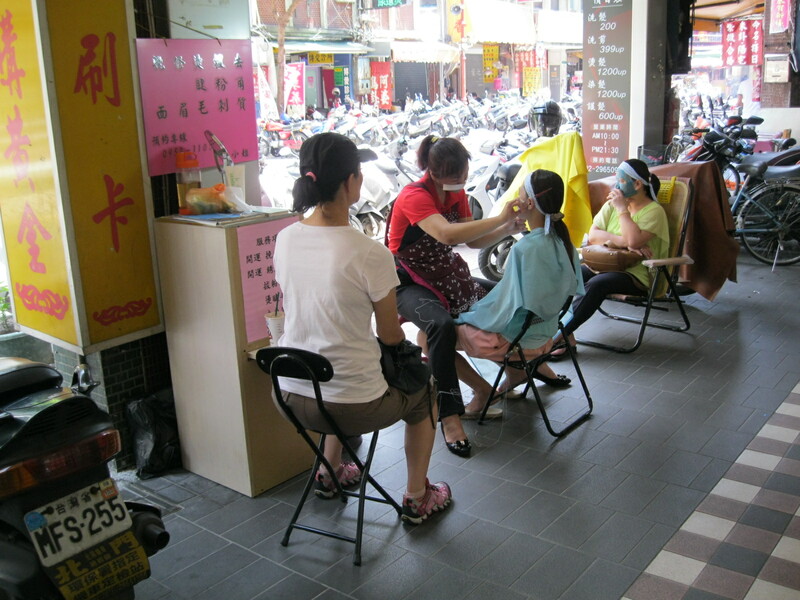 I saw women getting facials or having their eyebrows threaded at little beauty kiosks set up on the sidewalk; I noticed that many people made a quick prayer stop at the large Buddhist temple around the corner from my hotel, sometimes just pausing as they walked by to face the altar and bow with their hands pressed together before resuming their daily tasks. 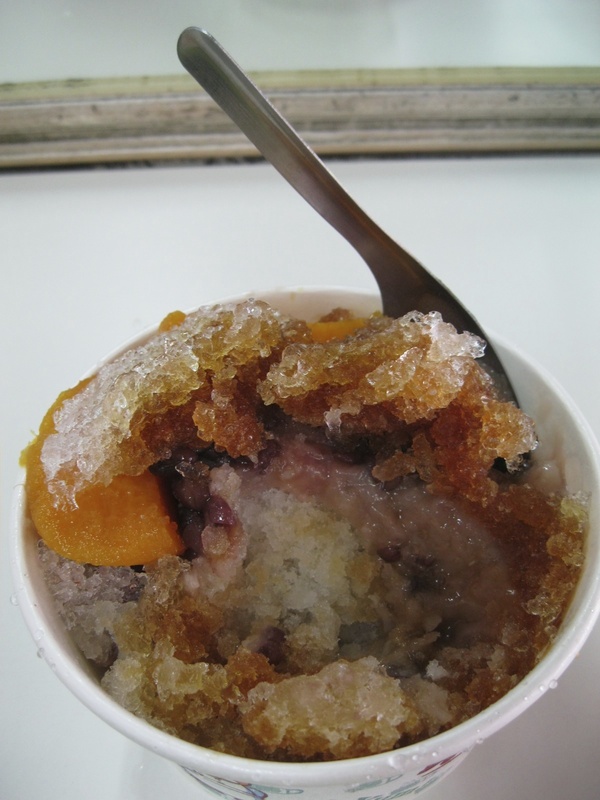 On my first afternoon in Banqiao, I got a shaved ice dessert at a little shop near the hotel—and when I stopped back for another three days later, the proprietor remembered exactly which four toppings I had ordered the first time (taro, sweet potatoes, peanuts, and red beans). It’s a neighborhood that makes it easy to slip into and become a regular in no time flat. Sidewalk beauty stall in Banqiao. But, there really isn’t much to see in Banqiao, so I took the subway into central Taipei every day and covered as much of the city as I could. I visited the National Palace Museum, which certainly has a great collection of traditional Chinese art but which was really too crowded with tour groups to enjoy. I followed a walking tour in my Lonely Planet that focused on significant examples of 19th-century Chinese and 20th-century Japanese architecture. I went to two baseball games (more about that later; I wrote an essay about it that I will post here, if I can’t place it elsewhere). I met up with a former classmate from the Hopkins-Nanjing Center who was spending the summer studying Chinese in Taipei and suggested we have lunch and catch up when she saw on Facebook that I was in the city. I visited Snow King Ice Cream (as seen in the Wall Street Journal) not once but twice to try their unusual flavors; the ginger was good, but the kidney bean was better. I spent a long, rainy afternoon in a small coffeehouse called the Café Kafka, slowly drinking an almond cappuccino and reading a book. 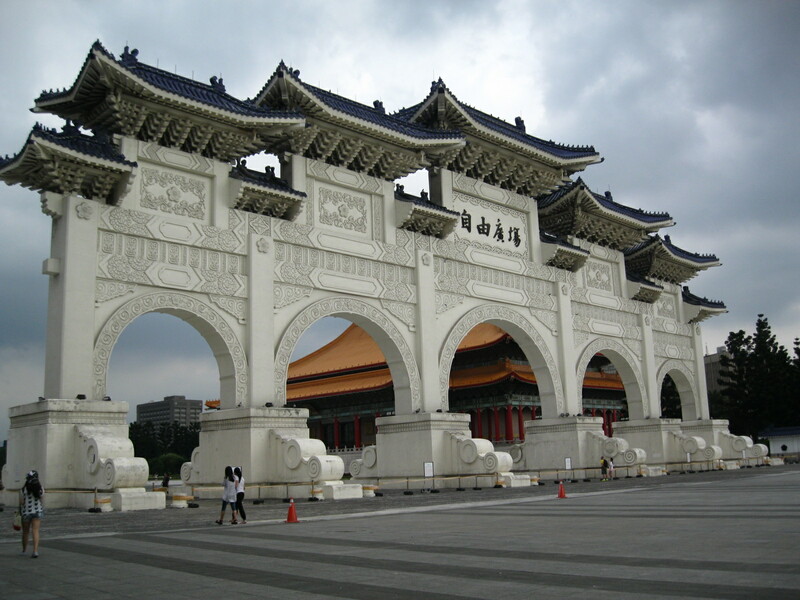 Entrance to “Freedom Park,” also the Chiang Kai-shek Memorial. Mostly, I walked and observed and took pictures and soaked it all in. After the last few months of Dissertation Completion Madness, I just wanted to wander around. I had marked a bunch of things in my Lonely Planet that I intended to do—a hike up Elephant Hill, a visit to a hot-spring spa outside the city, trips to picturesque villages at the end of the metro lines—but in the end, I decided to save those for my next trip. Before I knew it, Monday morning had arrived and I was wheeling my suitcase over to the Banqiao rail station to catch a train to the south. Getting to Kenting (which, incidentally, is pronounced ken-DING) is a two-part operation: a train to Kaohsiung city, then a 2 1/2-hour bus ride down to the tip of the island. But any dreams I had of dropping my suitcase at the hotel and heading to the beach were dashed before the bus even arrived in Kenting: for the last hour of the trip, we were driving through a massive rainstorm. The bus driver was nice enough to drop me off directly in front of my hotel so I wouldn’t have to slog down from the official bus stop. I checked into my room, found what may be Taiwan’s only country-and-western bar to eat dinner (with a waiter who was enthusiastically singing along to the Tim McGraw album playing), and called it a night. 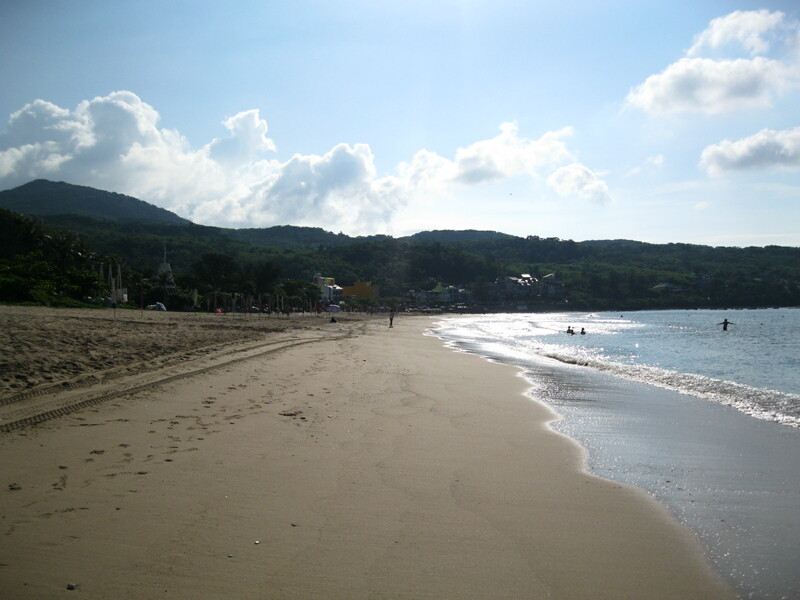 Nanwan Beach (which is actually one town north of Kenting proper). This was exactly what I’d been hoping for when I decided to do a beach vacation. Beaches on the mainland are often not that nice—the main exception being Sanya, on Hainan Island—and I’d been afraid that Kenting would turn out to be a disappointment. It wasn’t. Clear blue-green water, clean sandy beach, nice ocean breeze … it was perfect. However, it was also incredibly, unrelentingly, sunny and hot, and I realized after about three minutes outside on my balcony at 9am that even repeated applications of SPF50 sunscreen wouldn’t keep me from turning painfully pink during the height of the day. I’ve had bad sunburns before, and that’s not an experience I ever want to repeat. So I decided that my plan for vacation would be to stay inside until the late afternoon, then head down to the beach before dinner, when it was still warm but not as intensely sunny. 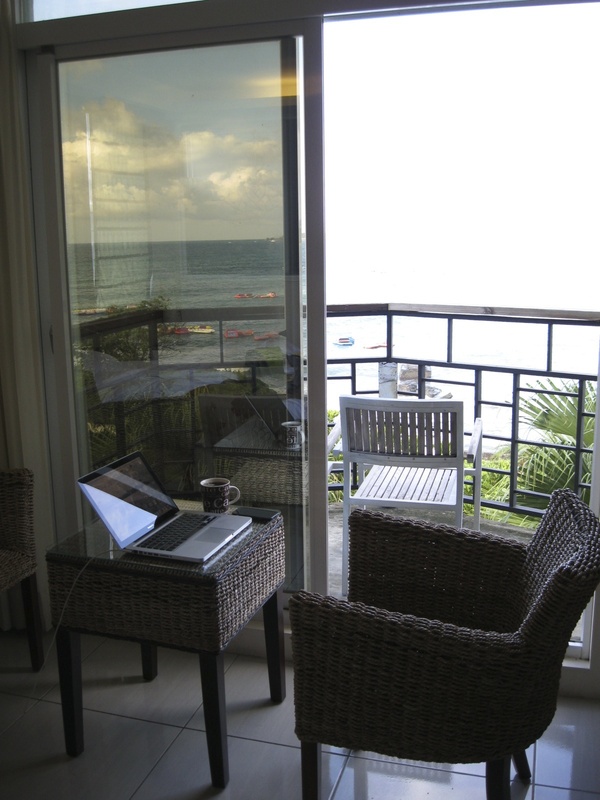 I set up my “vacation desk” right inside the sliding doors to the balcony and commenced several days of reading, writing, listening to podcasts, and staring at the ocean. Around 4pm each day, I crossed Nanwan Road and spent some time on the beach—though I’ve never learned to swim and am kind of afraid of the ocean, so this mostly meant wading in until the water reached my waist and then deciding that was far enough. There are a lot of things you can do in Kenting—rent a scooter and drive to the different beaches along the coast; go sailing or surfing; ride a horse; play paintball; drive a go-kart; visit the aquarium—but each time I thought about changing my routine, I’d decide that I really was happiest hanging out with my Kindle and a cup of coffee. 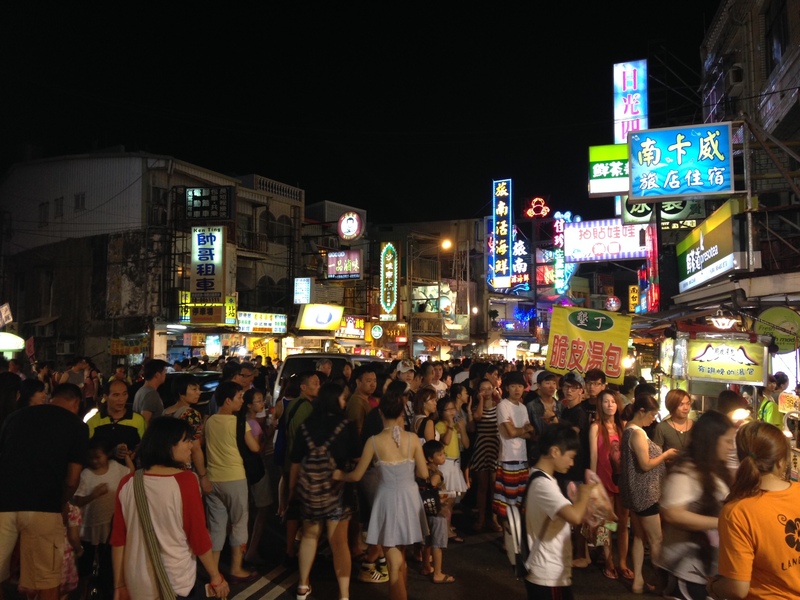 On Tuesday and Thursday evenings, I walked down to Kenting (which takes about 40 minutes, but it’s downhill all the way) and joined the crowds (and I mean CROWDS) of people at the town’s night market, a sort of Taiwanese take on the New Jersey boardwalk. On both sides of Kenting’s main street, vendors set up booths selling souvenirs, clothing, electronics accessories, and food. So much food. And that, of course, was why I was there—who needs a country-and-western bar when there’s street food to sample? I ate my first ever corn dog (I can wait another 32 years for the second) and fried Oreos for the second time (meh). I drank fresh milk out of a glass bottle, and a cup of outrageously sweet winter melon iced tea. My favorite selection was probably the Korean “burrito” of grilled beef and kimchi wrapped in seaweed. I contemplated trying the “drunken snails” but couldn’t quite get up the courage—nor could anyone else; those stands got a lot of lookers but no takers. I also avoided the “stinky tofu”—a Taiwanese specialty that I can’t stand to get near (there’s a stinky tofu shop directly across the street from my apartment complex in Shanghai, and when they get going, the smell that fills the air is pretty amazing [not in a good way]). And though I walked away stuffed both nights, I barely made a dent in the night market’s offerings: everywhere I looked, there was so much food. 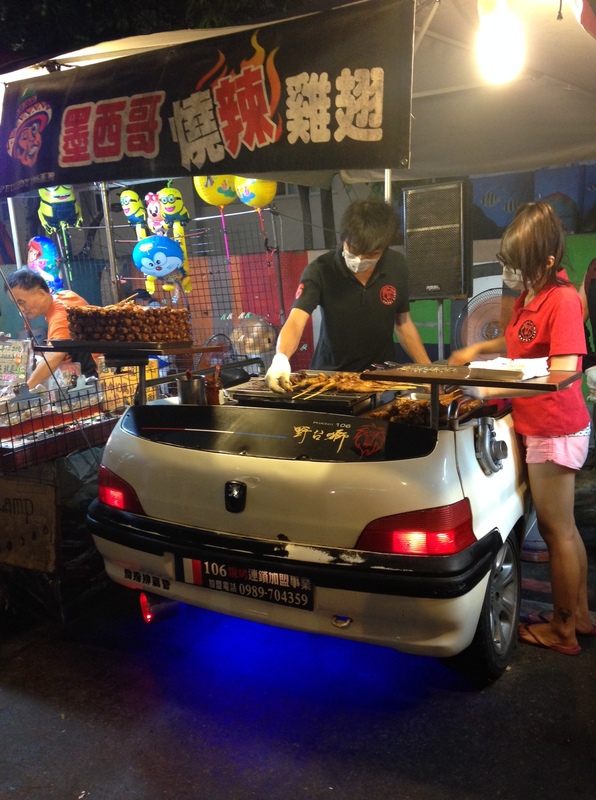 Grilling skewers of meat on a Peugeot barbecue. 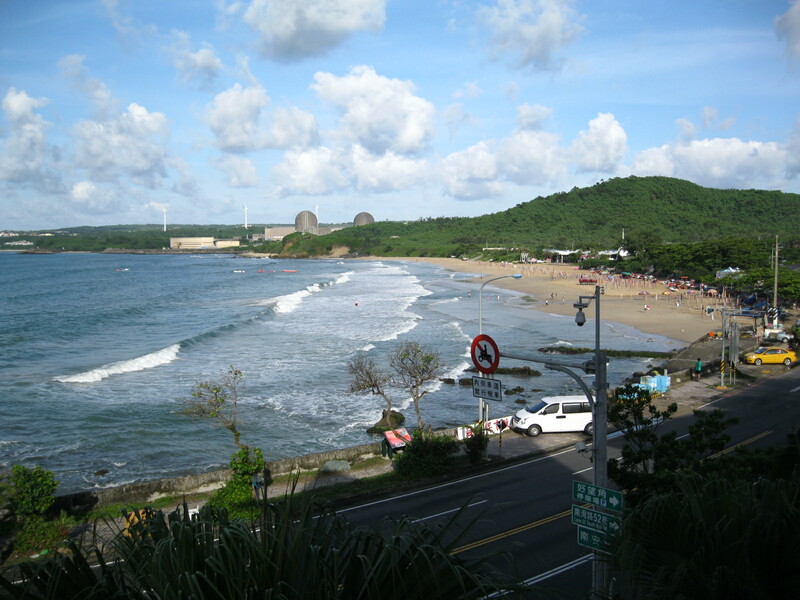 What really surprised me—probably more than it should have—was how similar Kenting felt to the beach towns I’m used to in New Jersey, Delaware, and Maryland. The main street was lined with shops selling t-shirts and board shorts, interspersed with bars advertising happy hours beginning in mid-afternoon and extending well into the night. Kids begged their parents to give them money to play the arcade games set up in the night market—target shooting, ring toss, basketball—and persisted until they’d won a cheap stuffed animal. Teenage couples fed each other snacks they’d bought at the night market stalls. It was all weirdly familiar, yet the Chinese characters on the signs, and the occasional waft of stinky tofu, reminded me that I was most definitely not in Delaware anymore. So did I do everything I planned in Taiwan? Not even close. Do I wish I’d done more? Sort of, maybe, but in the end, not really. Will I go back? Almost definitely. Because the rumors are all true: Taiwan is pretty great. Next Next post: So, What’s Next? Loved reading this blog. Thankyou. We are considering a business trip to Taipei & then a beach break in Kenting so this was perfect reading.